To date, there are 300 disorders associated with voice, but until now there has never been a published reference manual that classifies these disorders. Borrowing from the successful organization schema of the American Psychiatric Association’s Diagnostic Statistical Manual (DSM), the Classification Manual for Voice Disorders-I provides the framework for classifying voice disorders using the following criteria for each disorder: essential and associated features; vocal impairment; clinical history and demographic profile; course and complications; medical and voice differential diagnosis; and severity criteria. 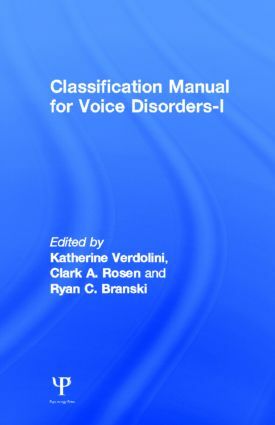 Classification Manual for Voice Disorders-I is a project of ASHA’s Special Interest Division 3, Voice and Voice Disorders (DIV 3), originally directed by contributing authors Moya Andrews, Diane Bless, Daniel Boone, Janina Casper, Leslie Glaze, Mike Karnell, Christy Ludlow, and Joe Stemple. The text was edited over a period of several years by the authoritative group of voice disorders professionals, including Katherine Verdolini, Clark Rosen, and Ryan Branski. This version represents the fields of speech-language pathology, voice science, and otolaryngology. CMVD-I lists most conditions that may negatively affect the ability to produce voice, based on the most current knowledge. These conditions comprise 30 structural pathologies, 25 neurological disorders, 20 aerodigestive conditions, 13 psychological disturbances, 15 systemic diseases, four inflammatory processes, four traumatic conditions, and five miscellaneous voice disorders. CMVD-I is a must-have resource for professionals who specialize in voice disorders, especially speech-language pathologists and otolaryngologists. The handy organization of this reference makes it a convenient and accessible resource for voice coaches and teachers of singing. It will also be invaluable as a textbook in master’s-level communication sciences programs throughout the world. Proceeds received by Division 3 will be used to support the mission of Special Interest Division 3, which provides continuing education and networking opportunities to promote leadership and advocacy for voice issues from professional, clinical, educational, and scientific perspectives. Contents: Foreword. Overview and Purpose. Voice Handicap Index. Voice-Related Quality of Life Measure (V-RQOL). Classification List. Structural Pathologies of the Larynx. Inflammatory Conditions of the Larynx. Trauma or Injury of the Larynx. Systemic Conditions Affecting Voice. Non-Laryngeal Aerogestive Disorders Affecting Voice. Psychiatric and Psychological Disorders Affecting Voice. Neurological Disorders Affecting Voice. Other Disorders Affecting Voice. Voice Disorders: Undiagnosed or Not Otherwise Specified (NOS).